“ Great design will not sell an inferior product, but it will enable a great product to achieve its maximum potential. ” ~ Thomas J. Watson Jr.
Benjamin Barker engaged us after comparing our aesthetic abilities against other agencies. So we made sure to design and build an elegant (and kickass) website that's inline with the quality of their fashion apparel products. 2013 has been a great year. Sendy has been a success for us, thanks to all who supported it by buying a copy and spreading the word. We have our fourth app ready and it's called, Cranked! Cranked is a self hosted RSS reader where you can run it on your own server like Sendy without paying any monthly fees. With Cranked, you can 'mobilize' any truncated articles, change fonts and sizes to your own liking and most importantly, sort articles by the best stories. 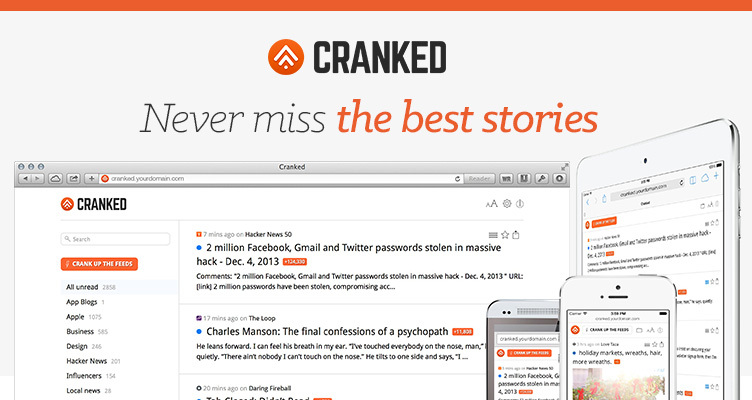 Cranked uses social media metrics from Facebook and Twitter to determine the most popular stories and load them first when you click the toggle button called 'Crank up the feeds!'. Check Cranked out, we hope you like it. Here's wishing you an awesome 2014! Sendy baby, where have you been all this time? 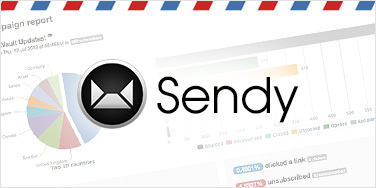 The answer to our email newsletter woes, Sendy is our latest app that sends trackable email newsletters 100x cheaper via Amazon SES (Simple Email Service). Yes, you read that right! Figuratively, that's 1 cent per 1000 emails. We knew we couldn't be the only ones out there who thought email newsletters shouldn't have to cost so much. So we are sharing Sendy with you. We are thrilled to share our second app, MockVault, with you. Akin to our first app–SUBERNOVA, which we built as a solution to manage our projects better–MockVault was created to improve the way we present our mockups. With MockVault, it is so much easier to walk our clients through mockups without being face-to-face with each other. MockVault bridges that gap. It makes explaining easy to do and getting the message across a breeze. MockVault has many features but our favourite has to be the Approve button! Why? While it really is just a button, somehow it works better than writing an email. Least that's what we've been told. Available as a web app, all you need is a browser and an internet connection. So get your mockups annotated and get your designs approved! Go get MockVault. 2011 would not have been possible without the support of our clients. 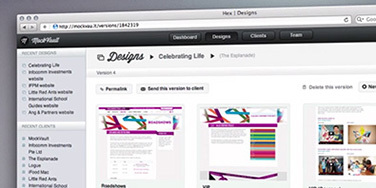 Here at Hex, we'd like to thank everyone who gave us the opportunity to build websites for them. We look forward to meeting new clients in the coming year. Here's wishing you a healthy and prosperous new year! 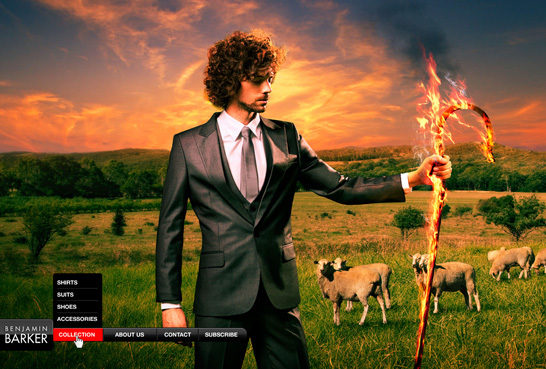 Our latest creation for Logue, an independant photographer, producer and writer, is now live! Fascinated with real experiences, Jean is passionate about living a life of adventure and creating social dialogue. Some highlights of her young career include The Children of Mekong, a project for the Lien Foundation that humanized water and sanitation issues through multimedia stories. We are excited to have revamped and launched Infocomm Investments website! A wholly-owned subsidiary of IDA, Infocomm Investments invests alongside leading VCs in growth-stage IT startups. Through its work, it aims to attract and nurture a vibrant pool of entrepreneurs and startups to enhance the technology depth and increase the diversity of Singapore's tech scene. We met the objectives of the brief, placing strong focus on the design. The site can also be updated easily through Wordpress. We just launched three new websites! Blueprint is a fashion trade gateway for East-West exchange..
Read more about Blueprint 2011's Website. Little Red Ants are five individuals who share a common interest in storytelling. They work with film, photography and motion art. Read more about Little Red Ant's Website. Ang & Partners is a law firm familiar to the maritime industry. Read more about Ang & Partners' Website. Two of our latest projects have come to fruition! 1-Caramel is a patisserie, cafe and atelier by the 1 Rochester Group. You can order cakes directly online and more. Read more about 1 Caramel's Website. Perniq is a home and lifestyle brand. They specialize in homeware created by skillful handcrafters from various parts of Indonesia. Read more about Perniq's Website. 1-Caramel is a patisserie by the 1-Rochester Group. Perniq is a home and lifestyle brand that sources unique homeware from various parts of Indonesia. Little Red Ants is a multimedia company that loves to tell stories through film, photography and motion art. MOC helps companies design and manage events. International Schools Guide - Singapore is an indispensable resource for parents considering enrolling their child in an international school in Singapore. Read more about International Schools Guide - Singapore website. Benjamin Barker is a fashion apparel brand started in Melbourne, Australia. Its quality line of suits, shirts, accessories and shoes can be found at Marina Square, level 2. Read more about Benjamin Barker website.